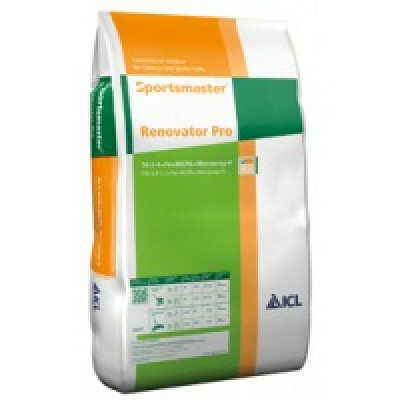 Sportsmaster Renovator Pro is a weed, feed and mosskiller that maintains growth and contains a selective herbiside for weed control plus iron for moss control. Contains selective herbiside for routine and heavy weed control. Contains Iron for moss control. Apply to dry foliage and irrigate after 1-2 days if no rain has fallen. Irrigation will aid dispersion and minamize any risk of mower pick up on any closemown surfaces. Aviod applications during frostly or drought conditions. Delay verti cutting and/or grooming for 3 days after application to allow th granules to disperse. Do not apply newly sown or turfed areas for 6 months after establishment. Avoid contact/ drift onto all broadleaved plants outside the target area. For best results apply when light showers or heavy dews are expected or irragate after 2 days. Grass should not be cut for 3 days before and 4 days after treatment. The first 4 mowing after treatment should not be used as a compost or mulch unless composted for 6 months. Re-seeding of bare patches should not be carried out until 8 weeks after treatments. Avoid walking on treated areas until it has rained or irrigation has been applied. Do not apply more than 3 applications per year.